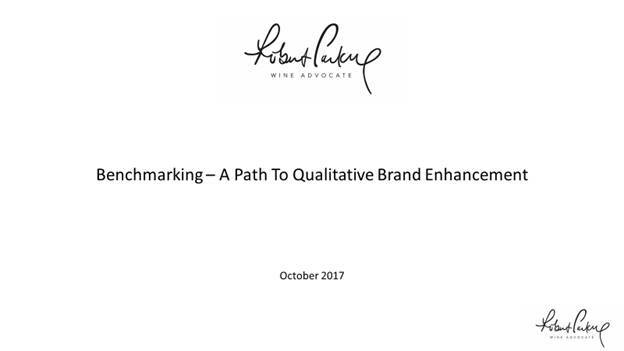 A new consulting service, "Wine Benchmarking" by Robert Parker's Wine Advocate, being launched this fall was introduced to the Colorado wine industry. I've reached out to Editor-in-Chief Lisa Perrotti-Brown and will update this post with more information when/if I get it. 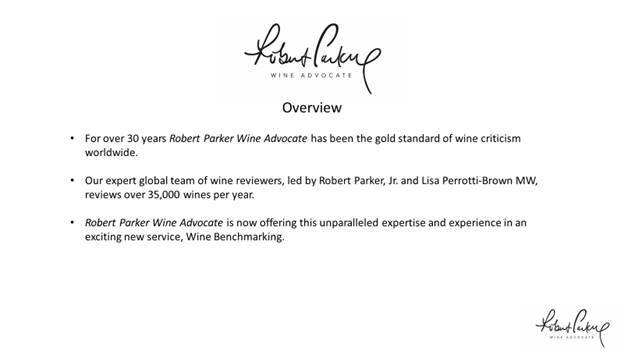 Described in the announcement, the Wine Advocate is providing detailed advice to wineries for $800 per winery. 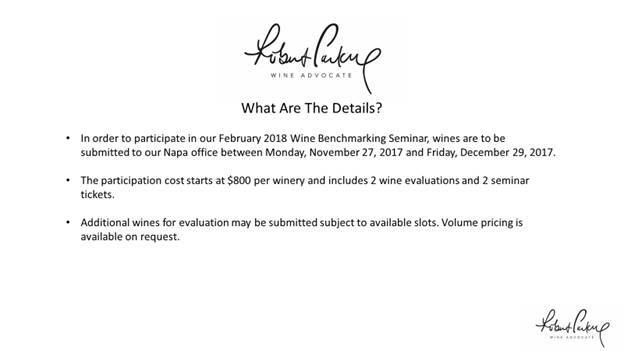 For this fee, wineries will get two of their wines assessed by Wine Advocate reviewers and receive two tickets to a "Wine Benchmarking Seminar" in February 2018. 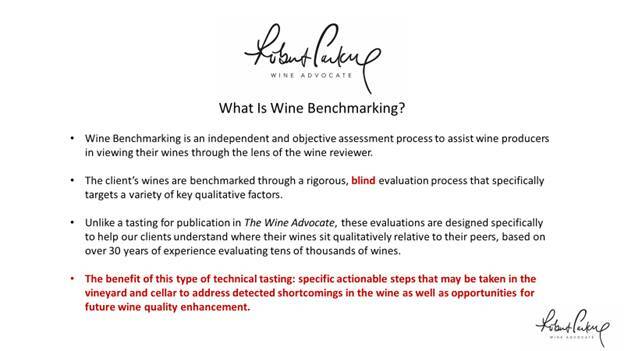 Additional wines for evaluation may be submitted subject to availability and volume pricing is available on request. 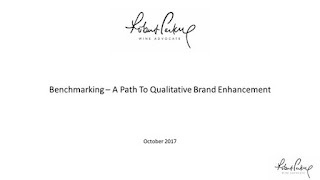 It appears that the main difference between this evaluation and the normal published evaluation is that wineries will receive personalized notification of where their wines sit qualitatively to their peers. 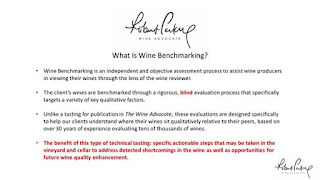 The Wine Advocate reviewers will also provide specific actionable advice that may be taken in the vineyard and winery to address detected shortcomings - as well as possible opportunities for future wine quality enhancement. 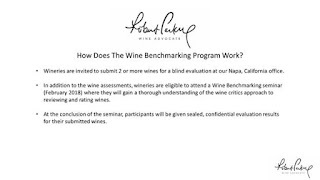 This information will be provided to wineries in confidential, sealed envelopes after February's seminar. 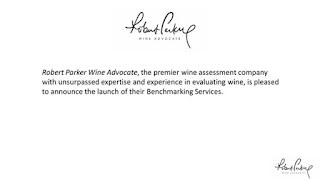 It would appear to me that this new service may result in a new direction from the fiercely independent critical approach Mr. Parker has espoused for years. However, this publication is Mr. Parker's now in name only. 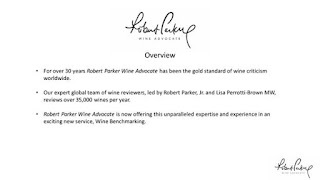 I am all for wineries hiring consultants to help with their businesses, but I don't see how an independent critic can start taking money from those he/she is reviewing and still claim complete separation from the trade. I can't imagine how this statement: "it is imperative that I keep a distance from the trade. While this may be misinterpreted as aloofness, such independence guarantees hard‑hitting, candid, and uninfluenced commentary" remains on the Writers Ethics page on RobertParker.com form much longer. 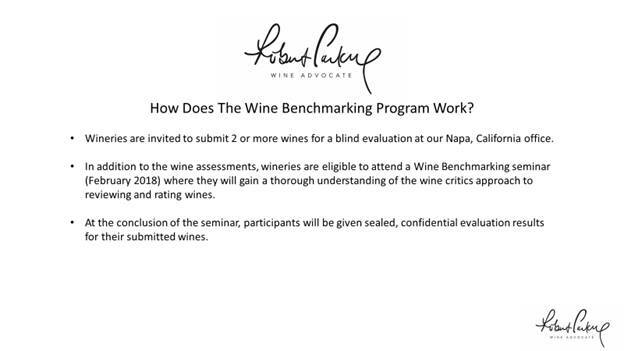 Don't get me wrong, as a proponent of small regional wineries, I think this could be a great opportunity for wineries to improve their wine quality, improve their scores and increase sales. Yet, shouldn't this kind of feedback be what wine reviews are all about in the first place? 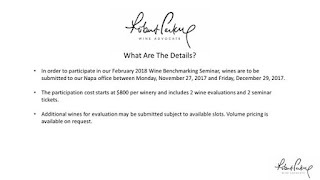 I've been advocating that all regional wineries submit wines for critical review to Wine Advocate, Wine Enthusiast, and Wine Spectator. 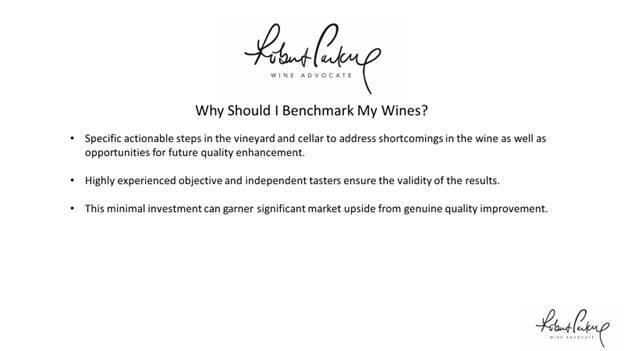 Critical feedback is very important to the wine industry. So is for-hire consulting services. My personal hunch is Mr. Parker had nothing to do with this. How did you find out about this? 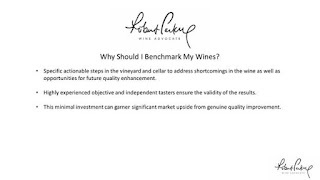 Did a winery hand it over to you or is it on their website? Truly curious to hear and will follow for sure . . . 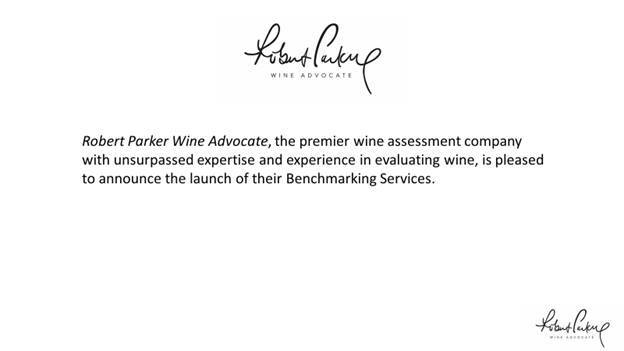 This was announced to the CO Wine Industry by a representative of the Wine Advocate. I can imagine wineries will be intrigued by this possibility... though that is a high fee for many small CO wineries.